If you are a follower of My Scuttle you will know that I love things that have an initial on it! Especially now that I have been able to actually find my initial (what am I talk about? - find out here). So naturally I love this watch. I have started falling in love with watches thanks to the influence of my friend Brittany over at Swell Studios who has a wee bit of an obsession with watches. I love the color brown of the band, it looks worn & more expensive then it actually is. Don't be fooled if you go to the page & look for your initial & can't find it. 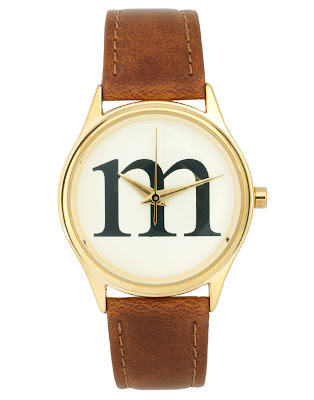 You have to go to the main watch page & you will find your initial because each letter is a separate listing. A good Christmas gift for those hard people on your shopping list, I think so! Thank you Asos for this watch steal!